Currently this looks ideal for players, but there seems to lack additional info (such as the fey hearthspell table). I think it could be a good idea to have a version which has all data needed to generate a character, tables included, in a single doc. My plan is to invent new mutations as an elf increases in level. All elves start with pointy ears because I'm lazy more than anything, and when someone plays an elf I'll make sure to keep a couple of steps ahead of the player. Do you have the numbers for your classes online anywhere? For example, I don't see how many experience points I would need to level a necromancer from level 3-4 and what his saving throws are. 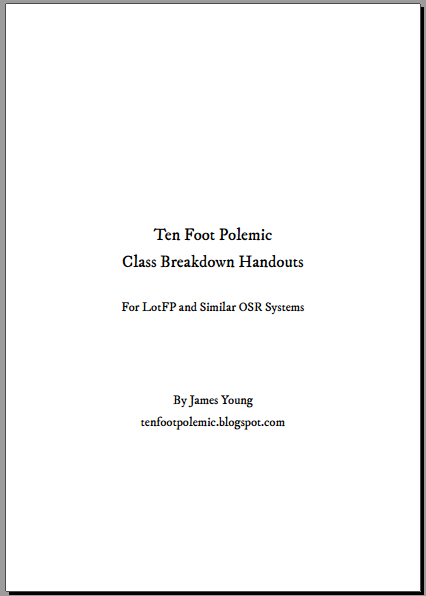 and the individual class posts (http://tenfootpolemic.blogspot.co.uk/search/label/classes). In general, the nonstandard classes use the HP/Saves/Exp of whatever regular class they're closest to. So Necromancers level as Magic-Users and Barbarians level as Fighters, etc.